Bay scallops are small, usually less than ¾” in diameter. They are sweeter, richer and typically cost more than other types of scallops. They can be seared, broiled or fried but the key to cooking is timing. When overcooked, they are tough and can lack flavor. 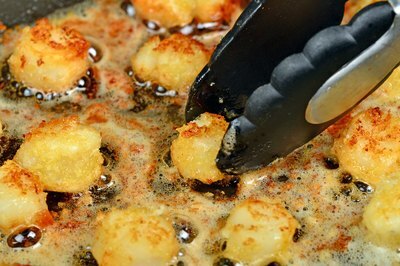 That makes frying them more difficult because of the need to brown the outside without overcooking the inside. Here are some tips for preparing the perfect fried bay scallop. Begin with making the right purchase, according to the website Mother Nature. Fresh bay scallops should not smell heavily of fish. They should have the light, airy aroma of the sea. The color should be off white or slightly pink. Old scallops are taupe in color or have a brown tinge to them. Mama’s Kitchen advises looking for dry packed scallops that are not treated with artificial preservatives like sodium tripolphoshate. The flavor will be better. Thaw frozen bay scallops in the refrigerator or place them in an airtight container and immersing them in hot water. 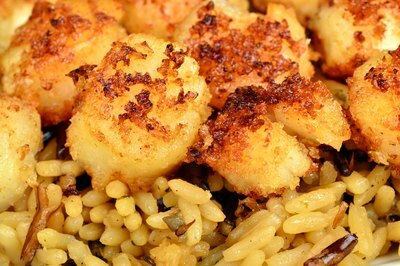 While scallops can be thawed in the microwave on the defrost cycle, it risks overcooking. Place wet scallops on a clean absorbent material such as a paper towel to remove excess moisture. Pat them completely dry. Using a pastry brush or a small, clean paintbrush, coat the scallops with a coating liquid like egg, olive oil or mayonnaise. Another alternative is to use spray-on butter or oil. The Recipe Zaar suggests rolling the scallops in plain flour. Better Homes and Gardens recommends batter frying using a batter made from a combination of eggs, milk, oil, sugar and flour. 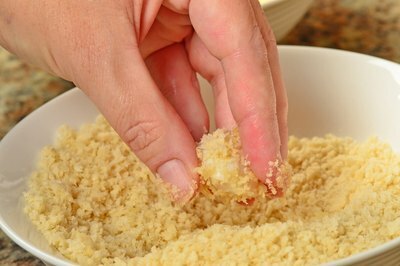 You can; however, also opt to use breadcrumbs, corn flake crumbs or crushed potato chips. Lightly toss or roll the scallops in the mixture until they are evenly coated. Pan fry bay scallops with butter using a medium heat setting for between two and five minutes, depending upon their size. Those 1/2 inch in diamer should not be cooked for more than two or three minutes while those 3/4 of an inch or slightly larger may take a little more time. Oven fry bay scallops by putting them on a cookie sheet in a 425 degree Fahrenheit oven for about five minutes per side. Squeeze lemon juice over the top of the scallops before serving or, better yet, serve the juice or lemon slices on the side so that each person can use as much or as little as they like.